It’s a busy month for releases from me, with issues of DC’s Convergence event, as well as John Carter: Warlord of Mars and Skylanders issues. But before any of those hit, two new books out this week. Or, one new book and one older book. 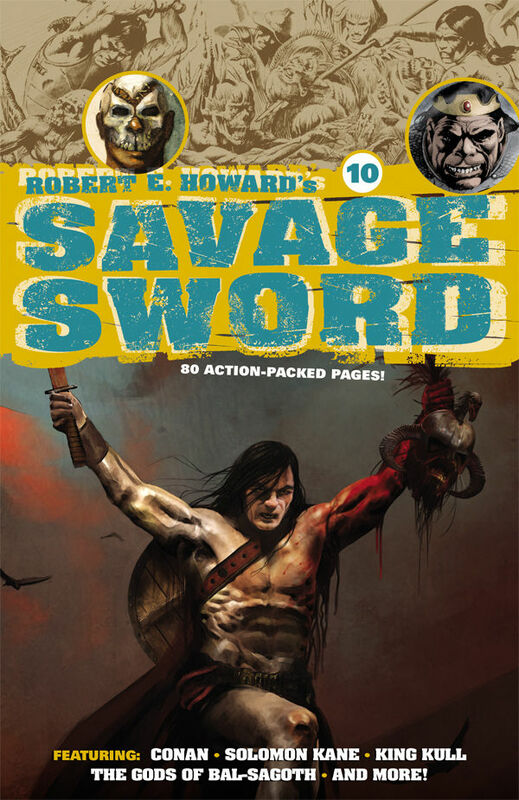 First up is Robert E. Howard’s Savage Sword #10 from Dark Horse, for which I’ve written a Solomon Kane short story. The art is provided by my friend Richard Clark, who beautifully painted the entire story. The story finds Kane in Africa, and you might pick up a reference or two to some other adventure literature. Kane is probably my favorite Howard character, even beyond Conan, so finally getting to a write a story featuring the grim Puritan avenger was definitely a bucket-list item. 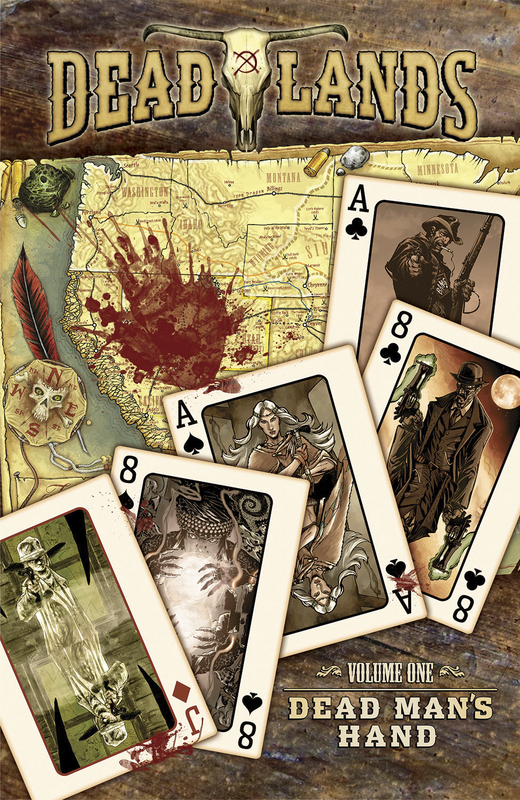 The other book is a collected edition of Deadlands Volume 1: Dead Man’s Hand from IDW. The individual issues collected here feature supernatural Westerns set in the Deadlands game universe by me and Bart Sears; Jimmy Palmiotti, Justin Gray and Lee Moder; David Gallaher and Steve Ellis; Jeff Mariotte and Brook Turner; and C. Edward Sellner and Ale Aragon. I edited the original issues from Visionary Comics, which were published by Image. This is the first full-size collection of the material. My story with Bart is one of my favorite single-issue efforts ever, introducing a mute bounty hunter who only communicates via a chalkboard around his neck. I had a great time writing (and editing) these Westerns; I hope it’s not the last time I get a chance to saddle up. Reading your name and Lee Moder’s together reminds me of Shinku and I was wondering, whether there were any plans to continue that book sometime. It’s one of my favourites from you, along with Samurai.
. The naming cootenvinns are bad and you don’t use any error handling. My recommendations:- Using ‘todo-list’ as a database name is a very bad naming convention, you always need backticks for your queries in this way. ‘todo_list’ makes more sense.- What about error handling? Using E_ALL for errors in PHP, using mysql_error for errors from MySQL? You don’t really help people debug their code in this way, only to ignore errors.- Why use uppercase table names? Lowercase is much easier and helps you make a distinction between SQL related words and table and column names.If you really want to create tutorials for newbies, start by teaching them the right stuff! « Messages from Marz < Liked it!